UPR Billet Rear Spring Spacers for your 2015-2019 Mustang S550 2.3 V6 or GT are made from 6061 Billet Aluminum. Perfect way to fine tune your ride height of the back of your car by installing these spacers on top of your springs. Allows for additional tire clearance without having to try different springs to find that perfect fit. 1/8 inch spacer raises car by 1/4 inch 1/4 inch spacer raises car by 1/2 inch 3/8 inch spacer raises car by 3/4 inch All of our Suspension Products are made with the Highest Quality materials and most expensive components. We spare no expense on our products and always stand behind them with our Lifetime warranty that no one else offers. 2015 2016 2017 2018 2019 2.3L Ecoboost V6 GT 5.0 Coyote S550 Mustang Roush Saleen & Vehicles. 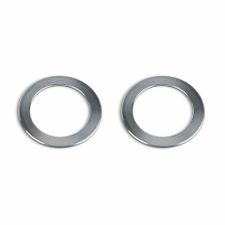 UPR Billet Rear Spring Spacers for your 2015-2019 Mustang S550 2.3 V6 or GT are made from 6061 Billet Aluminum. Perfect way to fine tune your ride height of the back of your car by installing these spacers on top of your springs. Allows for additional tire clearance without having to try different springs to find that perfect fit. All of our Suspension Products are made with the Highest Quality materials and most expensive components. We spare no expense on our products and always stand behind them with our Lifetime warranty that no one else offers.